Spanish instruction begins in Kindergarten, with classes twice a week. Students use puppets and songs to get comfortable with the new sounds, while playing games and learning about Latin American culture. Throughout, students learn the basics of how to read and write as well as how to speak and understand the oral language. 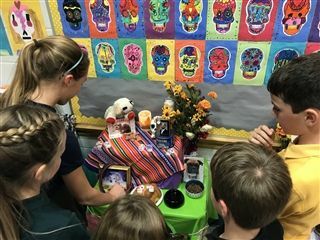 They are exposed to the cultures of Spanish-speaking countries through celebrations, music, and observances of Hispanic traditions such as Dia de los muertos and Las posadas. Starting in 7th grade, students may choose whether to continue Spanish and add Latin, or switch to Latin altogether. Students who have successfully completed the course work of Spanish I in 8th grade can enter the second year of high school Spanish.